Between Fences explored how people divide and protect, offend and defend through the boundaries they build. An everyday icon surprised and delighted audiences by telling stories about ownership and identity. Americans have fenced millions of miles and countless rivals have seized post, rail, board, and wire to stake a claim for home and happiness. 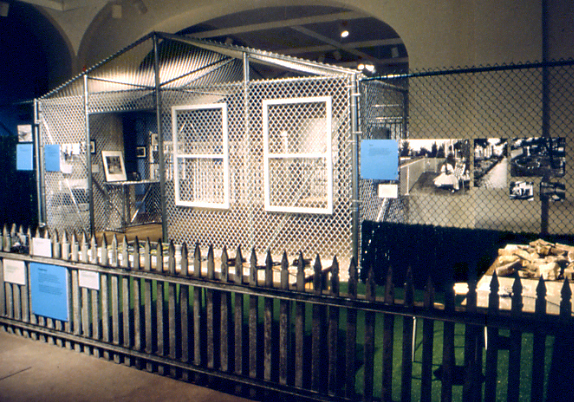 Chain link fence shaped an exhibition that drew people through environments that provided an emotional and historical setting for the exploration of relationships: neighbor-to-neighbor, community-to-community, and nation-to-nation. Dreicer transformed an overlooked object of design into a gateway that put people in touch with issues ranging from personal histories to national politics. His design concept turned empty space into a memorable experience. Fences are about relationships between people. They encourage conversation about ideas that shape American life. Redeveloped for the Smithsonian, Between Fences provided institutions and educators in small communities throughout the U.S. with opportunities for local humanities-based programming. Ninety-five percent of venues experienced an increase in attendance; at 28% of these venues, there was a 60% increase. The exhibition and its themes inspired all the articles in Journal of the Southwest 50 (Autumn 2008). Presented at National Building Museum, 1996. The Smithsonian Institution Traveling Exhibition Service traveled a small-format Between Fences exhibition in multiple copies to 148 communities in 23 states and one U.S. Territory, 2005-2012.